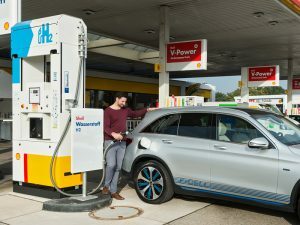 The new hydrogen filling station has been developed by Daimler and installed at a Shell forecourt, with technology provided by Linde, and offers a refuelling option to travellers between Hamburg and North Rhine-Westphalia. The site is located at Osterholzer Heerstraße 222 directly off the Sebaldsbrück motorway exit and the Bremen interchange, and is also near the Mercedes-Benz plant in Bremen, the company said, where the new generation of Mercedes-Benz fuel-cell vehicles will be produced including the GLC F-CELL – that combines fuel-cell and battery technology to form a purely electric plug-in hybrid. The three companies plan to build a hydrogen infrastructure across Germany, where they foresee hydrogen playing an important role in the country achieving its climate goals – thanks to emissions at a hydrogen fuel cell vehicle being only water and emissions producing the gas significantly reducing CO2, thanks to the use of renewable energy.